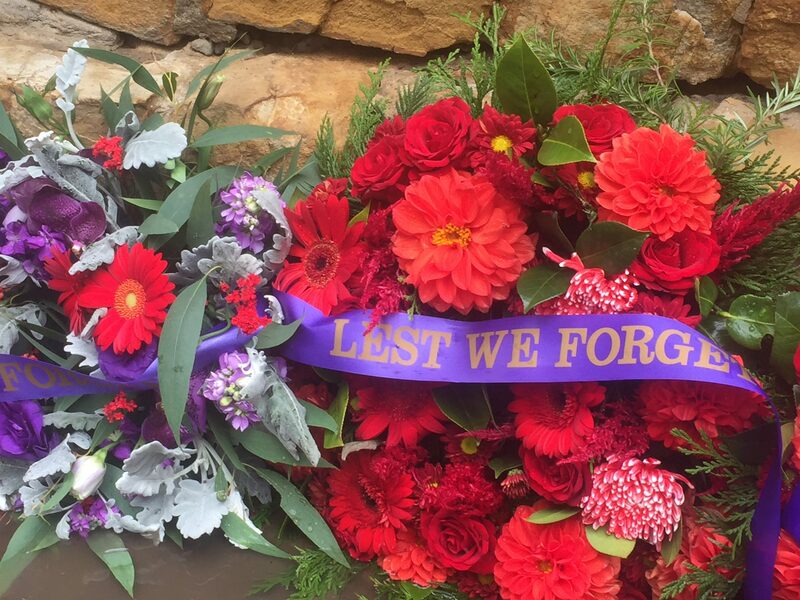 DAMP weather did not deter hundreds turning out for the Anzac Day memorial service this year at the Warrandyte RSL. Some 150 people participated in the march from Whipstick Gully to the memorial at the RSL. 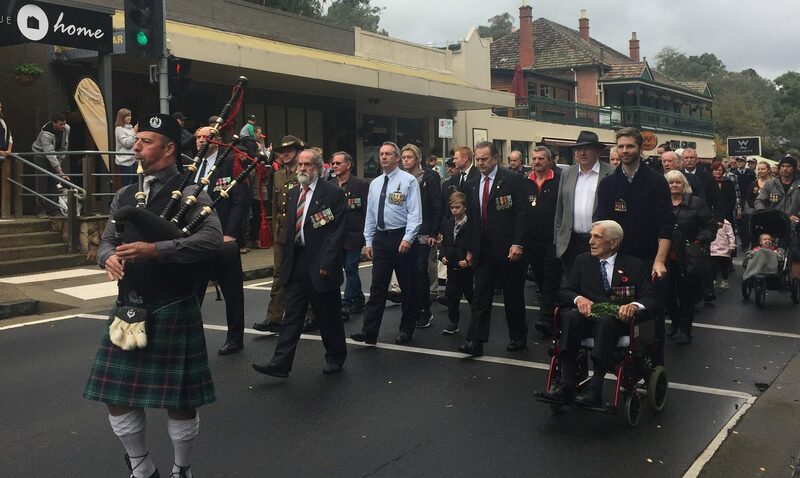 Lead by Ennio Torresan the march consisted of returned servicemen and women, their families, dignitaries and members of CFA, Scouts, Guides and local sporting groups. The marchers were joined by an estimated 800 strong crowd to take part in the service around the memorial. 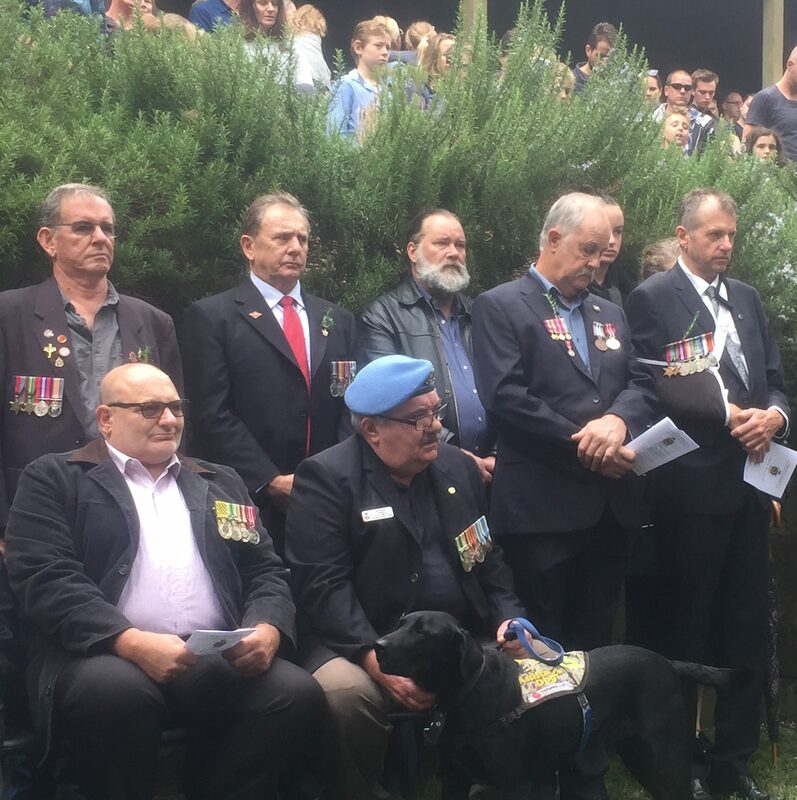 The address was conducted by John Byrne, who recalled the service of the late William Stringer who served in both World Wars, living in Warrandyte until his death at age 70 in 1965. And what would Anzac Day be without the Bellbird Singers beautiful rendition of I am Australian and Barry Carozzi performing his haunting It’s Not a Soldiers Job to Question Why? Following the requisite minute’s silence, wreaths were laid on the war memorial by local members of parliament Kevin Andrews and Ryan Smith along with representatives of other community groups and members of the public. The memorial was vandalised on Sunday night prompting swift action by the community to restore the shrine in time for the Service. Ryan Smith MP told the Diary he was inspecting the damage when he learned that the RSL was going to have to put on extra security to ensure the vandals did not return again before the service. “I was lucky to be here at the right time because I was able to offer to pay half of the $700 costs of the added security which the RSL would otherwise have to find from their own pockets,” he said. Warrandyte RSL President Hank Van de Helm thanked the community for the huge support that was given to the club after the desecration of the memorial. Federal Minister Kevin Andrews said the act was “absolutely disgusting”. “But the best answer to that is so many people turning out today,” he said. Local Councillor Paul McLeish said he was “proud of the way the community came together to right a wrong”. The restored memorial looked better than ever, so the silver linings from this despicable act were that Warrandyte’s war memorial received a face-lift and the RSL received that warm sense of community that rose from Warrandyte rallying together to erase the damage to our beloved institution. THE WARRANDTYE community awoke to the sad news that the RSL memorial had been vandalised overnight. The graffiti displayed the symbol for anarchy and the words “War is Murder”. While vandalism is always a hurtful act, the defacing of the RSL’s war memorial on the eve of Anzac Day was felt particularly strong within the community. The council were quick to act and soda-blasted the offending marks. However, this process also strips the gold trim out of the words on the memorial. 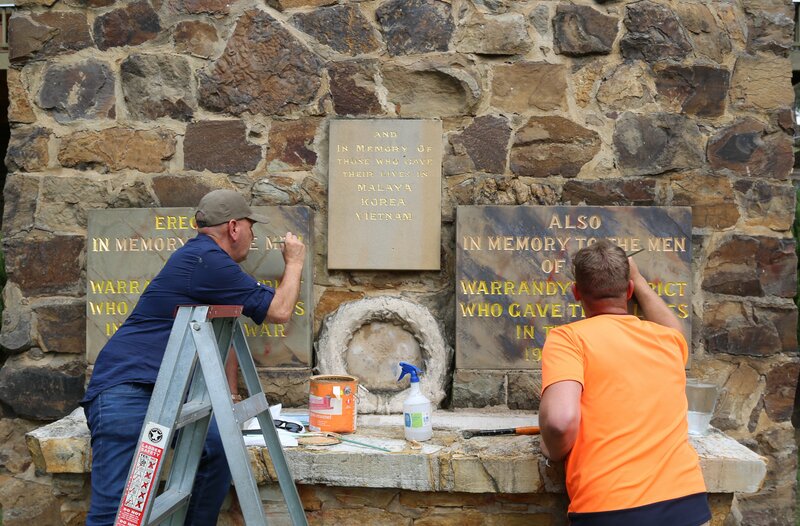 Stephen Papal from Advanced Stone, a company that specialises in the making bespoke headstones and memorials, contacted the RSL directly to volunteer his company’s services and restore the memorial back to its former glory. “I know what it’s like for RSLs and clubs to try and find the money to cover up something that’s been vandalised. “I rang them because I knew they’d soda-blast it, the process should be to sand it and touch up where the graffiti has been. “This will look magnificent tomorrow”, said Mr Papal. Local Member of Parliament, Ryan Smith also visited the memorial to see the damage for himself and personally thank the men who had come out to undo the damage. In an interview with the Warrandyte Diary, Mr Smith expressed his appal on last night’s criminal act. Mr Henk Van Der Helm, President of the Warrandyte RSL stated: “We are pretty disgusted with this act but we’ve been able to clear it off”. The Warrandyte RSL have decided to pay for security around the War Memorial tonight over concerns that the publicity that has been generated may encourage the “ratbags” to return. Mr Van Der Helm is confident that the Anzac day ceremony will go ahead, as planned, tomorrow morning. Despite the attempts to deface the Warrandyte memorial, the RSL’s Anzac Day service will go ahead tomorrow morning, as planned. The march will start from Whipstick Gully at 10:30am with a service to follow from 11am. Suzanne Reid’s favourite appliance isn’t her microwave or television – it’s her sander and these days it’s been working overtime bringing life back to old furniture. 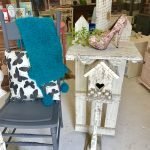 As a lover of all things ‘whimsical’, Suzanne enjoys nothing more than finding discarded treasure and giving it a new life with some TLC, sanding or Danish oil. 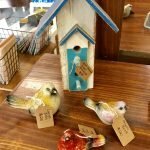 She has a natural talent for looking at what some might call rubbish and see it in a new light with a varnish, a polish or lick of paint and turn it into beautiful, useable piece for the everyday home. Originally Suzanne started putting her creations on eBay as a hobby but found her pieces were selling quickly and were in high demand. When a shop in Warrandyte became available she knew this was her opportunity to expand her designs and wares and share with the community. Her son Campbell also has a keen eye for finding those distinctive items as well as helping out in the store after school or on weekends. With four uncles, three of which live on farms, she has a fabulous source of stock from clearing sales and estate auctions — plus her close family are on board, finding the odd gem at a garage sale or op shop and passing it on for refurbishment. 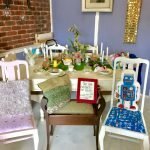 Suzanne occasionally buys items from the Rotary Op Shop, spends some time sprucing it up and when it sells, she donates 10% back to the Op Shop. Whimsical Treasures has been cleverly set out with a theme of each room in a home such as a dining room, kids space, lounge and more. This adds to the intimate ambience that is inviting and intriguing with little items sprinkled throughout each theme. Look out for the cute little knitted bears, rabbits and pigs handmade just for the store. Suzanne can accept items from the public that they’d like her to spruce up such as a sideboard or table – as long as they can fit in her front door. She is also happy to accept donations that support her unique vintage/retro /repurpose style. THE Grand Read may not have been going for as long, but this literary event has long been the cherry on top of the fabulous cake that is the Warrandyte Festival. Grand Read regular Jock Macneish gave a warm introduction, setting the tone for an intimate evening in the packed-out function room of the Grand Hotel. 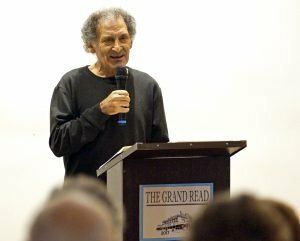 This year’s featured writer was Arnold Zable. He is an advocate for human rights and a lot of his work focuses on the experience of immigrants. He has many literary accolades to his name, including: People’s Choice Award: Tasmanian Pacific Fiction Prize for his novel Cafe Scheherazade (2003), nomination for The International IMPAC Dublin Literary Award for Sea of Many Returns (2010), and Life membership to Writers Victoria (2015). Arnold Zable writes about refugees and the plight of the human condition, he describes his writing as a “beacon of hope for those displaced, disconnected, and disorientated”. 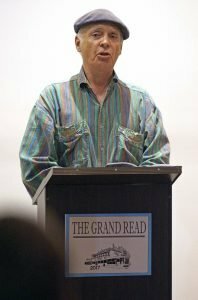 He described his writing as “painting with words” and before every passage read he would ask the audience of close to 100 if we could “see it”. Zable chose to read from his latest book The Fighter: A True Story. He writes about the life of Henry Nissen, an immigrant from Germany who settled in the working class suburbs of Melbourne and represented Australia as a flyweight boxer in the 1960s and 1970s. Zable’s words recreate the harsh world that Nissen grew up in, but he spun his prose poetically and the audience hung on every word. The Fighter: A True Story has been shortlisted for the 2017 Victorian Premier’s Literary Award for Fiction. The Grand Read frequently favours poetry over prose, as the shorter form fits well with the evening’s format. Following Arnold Zable’s poetically woven words were a series of enjoyable poems from a variety of artists. John Jenkins read extracts from his poem The Wine Harvest, a poem that reflects on a time, in 1999, when he worked as a labourer on the wineries of the Yarra Valley. His poem displayed some wonderful allegoric qualities as he recounted the hard life of a labourer through wine tasting terminology. 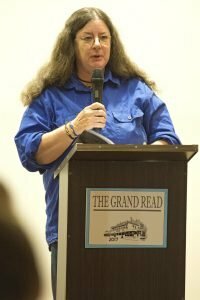 Karen Throssell, who has published a number of poetry books including Chain of Hearts, and The Old Kings and Other Poems, and who currently teaches Creative Writing classes in Diamond Creek, took the evening along a path of politics with a whimsical poem exploring her observations of Donald Trump’s youngest child during Trump’s victory party following the 2016 US presidential election. Andrew Kennon reflected on his experiences in the High Country. Sandy Jeffs, originally from Ballarat, is a poet who writes about her experiences living with schizophrenia. She is an advocate for living with mental illness and author of the best-selling book Poems from the Madhouse. For the Grand Read, Jeffs read a couple of poems: Cold Chemical Comfort illustrated the numbing effects of modern day drugs, while her poem about celebrity and the fascination with it that popular culture demands, was sobering but refreshingly chemical. Kevin Bonnett, author of De-icing the wings, read from his poem Lake Louise as well as a series of responses to photographs. Laurie Webb is a bush poet who spends a lot of time working with local communities in Africa. He read from his latest poem Gratitude Journal which is based on his experience with PTSD after being involved in a car crash in the Congo. 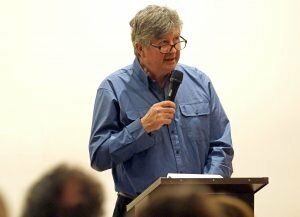 The evening also featured a reading from Warrandyte’s own Jock Macneish, whom recounted a trip he made some years ago to Scotland, where he went on a journey to find George Orwell’s lost motorcycle. You can read his story in the travel section of this month’s Diary. The evening was a wonderful finish to the festival and the poetry and prose on show was stimulating and inspiring. 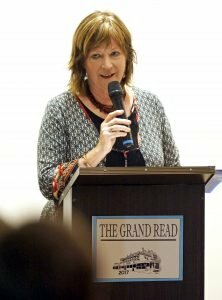 If you have never been to the Grand Read before, then make sure you come along next year, I certainly cannot wait to see who they will have on show in 2018.